With a solo movie in production, Captain Marvel (Carol Danvers) is about to join the wider Marvel Cinematic Universe, and with that, become Marvel’s signature female hero. After all, she has Marvel right there in her codename. 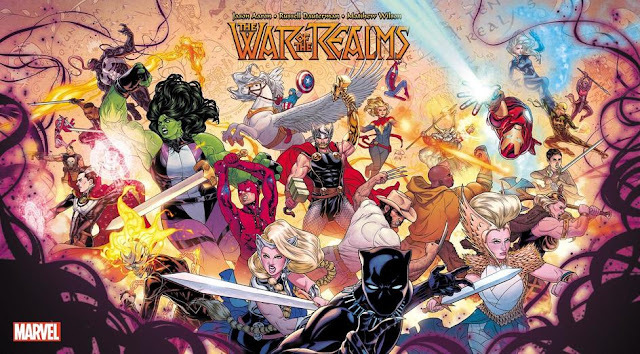 Marvel has never had a flagship female character in the same way that DC has had with Wonder Woman. 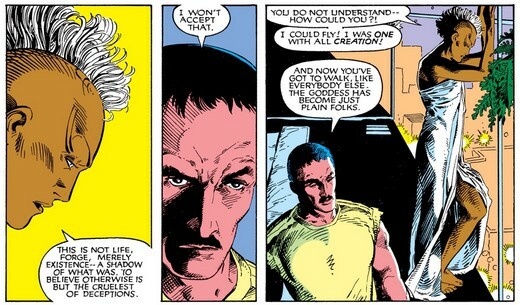 Susan Richards, the Invisible Woman, has had a strong case for filling that role as part of Marvel’s first family. It’s that same allegiance, I believe, that prevents that from happening. Now yes, you could argue what the point even is in having a “flagship” character, especially when you take into account the lack of gender equality in this genre. There is no need to single out only one fictional woman to carry this proverbial flagpole. But our society likes to debate the best of everything, to an annoying degree in sports specifically, so let’s just take all of this with a huge grain of salt. 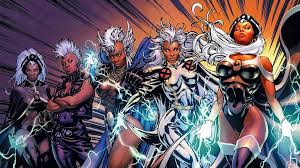 As with the Invisible Woman, Storm has arguably been Marvel’s most popular female character for decades, but it’s that affiliation with one specific team, the X-Men, that has kept her from fully taking the reigns as a flagship character. Or is that just all in my head? Let’s take a look at what makes Storm such an interesting superhero and maybe then we can determine if she needs a bigger multimedia platform than what has been awarded her thus far. Ororo Munroe is the daughter of a Kenyan tribal princess and an American photographer. As a young girl her and her parents lived in the Egyptian city of Cairo. During the Suez Crisis, a fighter jet crashes into their house, killing both of her parents, and leaving her trapped in the rubble for days. As a result, she develops a crippling case of claustrophobia that would plague her even into her days as a part of the X-Men. Orphaned and alone, Ororo was forced to become a thief and pickpocket on the streets of Cairo, at one point even stealing the wallet of her future mentor Charles Xavier. Some time later, after developing her mutant powers to control the weather, she is worshipped as a goddess by an African tribe in the Serengeti. It was at this point that Professor X found her and asked her to join his new team of X-Men (in the legendary Giant Size X-Men #1). Taking the codename Storm, she became a formidable member of this new squad of X-Men, alongside Cyclops, Wolverine, Nightcrawler, and Colossus. She developed a strong friendship with Jean Grey in those early years. Later, when Kitty Pryde joined the team at the age of 14, it was Storm that took on the role of mentor and big sister to the young woman. 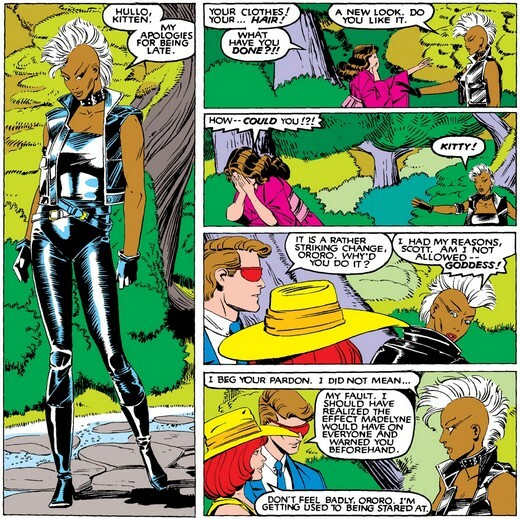 Cyclops eventually left the X-Men following the death of Jean, and Storm supplanted him as the new leader of the team, a role she filled capably for many, many years. The X-Men came into conflict with a sewer-dwelling community of mutants called the Morlocks. The Morlocks were mutants who could not, or would not, be able to blend in with society above due to their mutations, unlike the X-Men who were all quite handsome and charming. To save her fellow teammates, Storm challenged the Morlock leader Callisto to a duel, with the winner being declared leader of the Morlocks. This battle would be fought without using their mutant powers, and it must be fought to the death. Storm won, stabbing Callisto in the heart. Only the intervention of a Morlock healer kept Callisto from dying. After this, Storm began to develop a darker side. At Wolverine’s wedding in Japan, Storm meets Logan’s old friend Yukio, and they quickly become friends. Yukio encourages Storm to embrace her wilder side, to lose her inhibitions and run free. 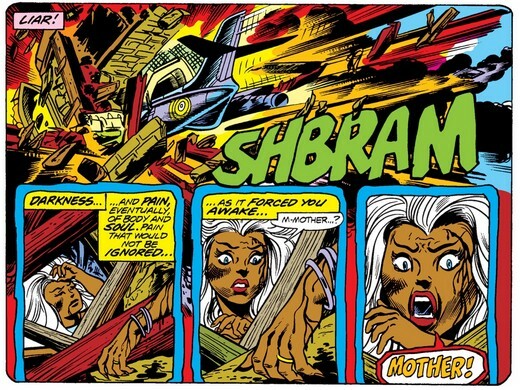 Storm’s emotions had always affected her mutant abilities to control the weather. Letting her emotions run wild had frequently resulted in uncontrollable and dangerous weather events. That, combined with her past as a goddess, forced her to maintain a regal and restrained personality, but with lots of warmth and compassion for the ones she loved. It was then that she debuted her infamous punk look, shaving her flowing white hair into a mohawk, and donning lots of black leather. This would drive a big wedge into her relationship with Kitty, who was scared by her mentor’s drastic change in appearance and attitude. Shortly after that, Storm lost her mutant powers at the hands of a weapon fired by Henry Peter Gyrich. The intended target was Rogue, a new member of the X-Men, and a former member of the Brotherhood of Evil Mutants. Rogue’s ability to absorb the memories and powers of other people had gone to the extreme when she (bringing this article full circle) accidentally stole the memories and powers of Carol Danvers permanently. With two voices trying to claim the inside of her head, Rogue ran to Xavier for help, and he agreed, much to the chagrin of the X-Men. However, this affiliation didn’t mean the U.S. government still didn’t want her neutralized, so they commissioned the mutant inventor named Forge to make them a weapon that would remove mutant powers. 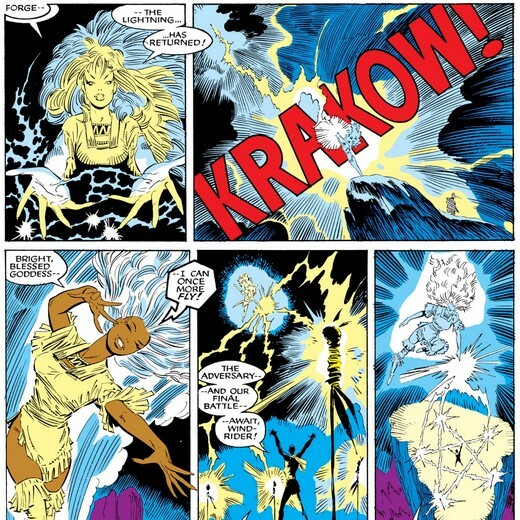 Storm struggled mightily with the loss of her powers, not just because of what they meant to her as a superhero, but because they had connected her to the elemental forces of the Earth in a deep and profound way. Losing that connection was almost unbearable for her. 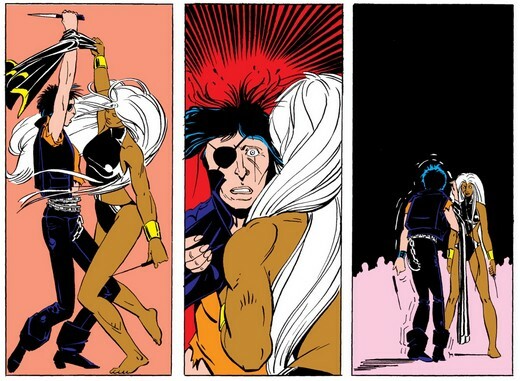 Storm coincidentally met and developed feelings for Forge, but their romantic relationship was cut short when she learned that it was he that had created the weapon that had devastated her on such a personal level. Storm remained as leader of the X-Men, proving herself more than capable of the task even without her mutant powers, until Cyclops returned, seeking to reclaim his status as the team leader. Storm and Cyclops dueled for leadership of the team, and in one of the greatest X-Men stories in the history of the series, defeated him without her powers. Storm finally regains her mutant powers in the Fall of the Mutants storyline, where the whole world believes the X-Men to have died while defeating the Adversary. She is resurrected by Roma, loses her memory after walking through the Siege Perilous, and is reverted to childhood by the mutant Nanny. Once again a child thief in Cairo (Illinois, this time) she meets and partners up with a mutant named Gambit. Her and Gambit remained as a duo until the X-Tinction Agenda storyline, where she is finally returned to adulthood and all the disparate X-Men characters are reunited as a team again. That’s about where my knowledge of the X-Men ends. In recent years, a romantic backstory was revealed between her and T’Challa, the Black Panther. This culminated with the two of them getting married, and her becoming Queen of Wakanda. The two of them never made much sense to me, seeming a little too contrived and convenient, but I have to admit it’s much better than her and Forge, which was a pairing that lasted for far too long. I hate Forge. 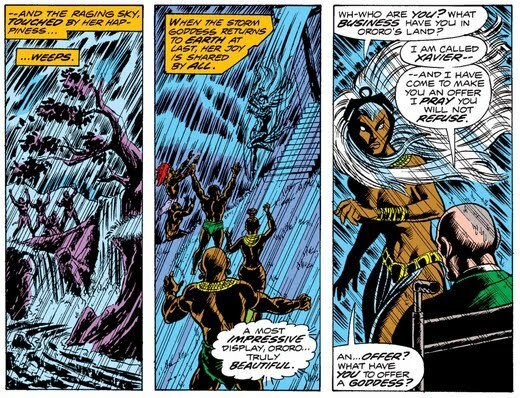 Over the years, mutants would develop an increasingly hostile relationship with Wakanda, eventually causing T’Challa to annul his marriage to Ororo and end their relationship. But their love and connection with each other would continue to this day. Storm has had a long and interesting comic book history. From a pickpocket thief on the streets of Cairo, to weather goddess, to mutant superhero, to capable leader of the X-Men, to punk-rock killer, to thief on the streets of Cairo (again) and to Queen of Wakanda. Child pickpocket was especially intriguing to me, and we got a glimpse of it in X-Men: Apocalypse. Unfortunately, she almost immediately turned evil and the rest of that movie was a bit of a mess. 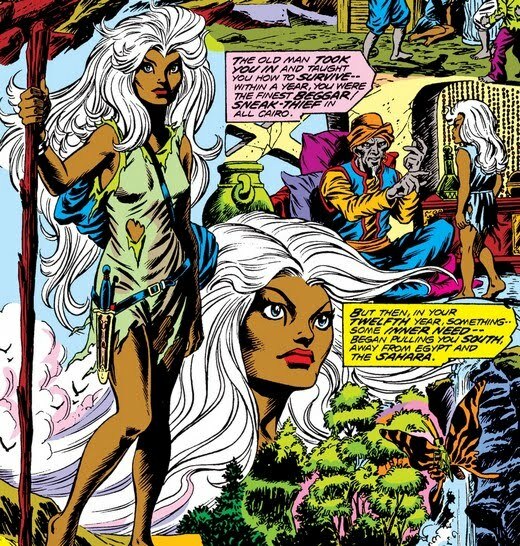 Storm has also had short stints as a member of the Fantastic Four and the Avengers. She retains her prominent role with the X-Men, who at one time were the preeminent superhero team not just at Marvel, but in all of comics. She's forever linked to the hottest superhero character of 2018, the Black Panther. She's been a major character in multiple animated series, movies, and video games. The groundwork and connections are already there for her to take a more prominent role in the Marvel Universe. The potential is there. The battle for status of flagship character may already be over once Captain Marvel joins the MCU, but Storm has a history of emerging victorious in duels against stronger opponents. She’s done it not once, but twice. Maybe someday we’ll see a third time. Stay tuned.